Synopsis: Ava is the captain’s daughter. This allows her limited freedoms and a certain status in the Parastrata’s rigid society-but it doesn’t mean she can read or write or even withstand the forces of gravity. When Ava learns she is to be traded in marriage to another merchant ship, she hopes for the best. After all, she is the captain’s daughter. Betrayal, banishment, and a brush with love and death are her destiny instead, and Ava stows away on a mail sloop bound for Earth in order to escape both her past and her future. The gravity almost kills her. Gradually recuperating in a stranger’s floating cabin on the Gyre, a huge mass of scrap and garbage in the Pacific Ocean, Ava begins to learn the true meaning of family and home and trust-and she begins to nourish her own strength and soul. This sweeping and harrowing novel explores themes of choice, agency, rebellion, and family and, after a tidal wave destroys the Gyre and all those who live there, ultimately sends its main character on a thrilling journey to Mumbai, the beating heart of Alexandra Duncan’s post-climate change Earth. I picked this as one of my most highly anticipated books in 2015 and when I got to about 10% I was SO scared that I wasn’t going to like it. The beginning is a bit difficult to get into. The writing in this entire book is rich and layered and incredibly intricate and detailed. Ava, and her people, have their own form of English. The rules are never fully explained, and the social structure that Ava knows is shown, never really explained. So if you aren’t willing to work a little bit to get into this book, then you might have trouble with it. THANKFULLY I was able to get into it and it just FLOWED from there. I made the mistake of reading a few reviews on here before reading this and had a small part of it spoiled. So when I got to a certain point in the book I was SO scared about how it was going to work based on the spoiler. And I feel that this is how my entire relationship with this book was. Ava would make choices that made me go NO DO NOT DO THAT OMG PLEASE DON’T DO THAT because she was heading into directions that really turn me off in the YA genre. Thankfully every time it seemed that the book was going to head into a undesirable direction, it made good choices, right choices, and satisfying choices. I have never been so pleased so many times in a single book. This is basically a story about a girl growing up. Ava was born and raised in space, on a ship that travels between a space port above Earth, and Mars. Her ship has it’s own unique culture, which we later find out was a product of time and isolation. Women have children, cook, clean, do simple jobs, and aren’t allowed to learn how to read, write, do math, or anything mechanical. Ava knows this and grows up looking forward to when she can become someone’s bride. The men take multiple wives and are allowed to travel between the space ship and Earth. Women are told that they can’t handle the Earth’s pull, but really it’s just that they aren’t allowed to keep their bodies in shape and therefore they are unable to physically handle gravity. Ava is sent to be married but she gets caught in a scandal and is instead sentenced to death. She manages to escape and goes to Earth where she makes friends, suffers heartbreak, finds her only remaining family, and learns that women are capable of so much more than she ever imagined. She learns that she can use her skills and learn new things. That she can have a life and happiness. I loved Ava. She walks a fine line between innocence and experience. She is so mature and naive at the same time. She is smart and thinks about her actions and even when she is irrational she later visits her mistakes and does the right thing. She loves with all of her heart and only wants to be loved in return. Her character development is amazing and I was so happy with every choice she made, right up to the very end of the book. The rest of the characters are wonderful as well. The heartbreaks suffered are so real, and the world is so vivid. I love how it feels futuristic and dystopian at the same time. There are elements that are similar and familiar enough that this book is easy to picture, but I could also imagine it as a big-budget movie with lots of amazing special effects. And the writing… it’s so lush and beautiful. Once I got used to the way Ava and her people spoke, I even began to enjoy it. I highly recommend this. And don’t be fooled by the few reviews saying that there’s a love-triangle, there isn’t. 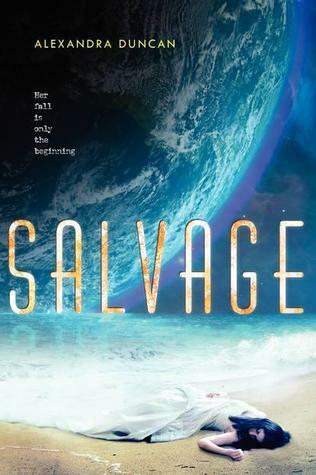 This entry was posted in Uncategorized and tagged arc review, book review, edelweiss, feminism, greenwillow, River, science fiction, ya on March 23, 2014 by samcmar.